We’ve never taken Oscar to see any kind of ‘show’. When your autistic child has a history of struggling to sit and attend to anything, you just avoid things that are likely to demand that of him. No theatre, no cinema, no concerts and no circus. Our small town is regularly visited by a circus and for the last few years Oscar kept asking to go. The thought of it worried me. The noise, the lights, the atmosphere, the sitting and attending. How would he cope? So I just kept putting him off. It might sound mean but it just didn’t feel like the time was right. 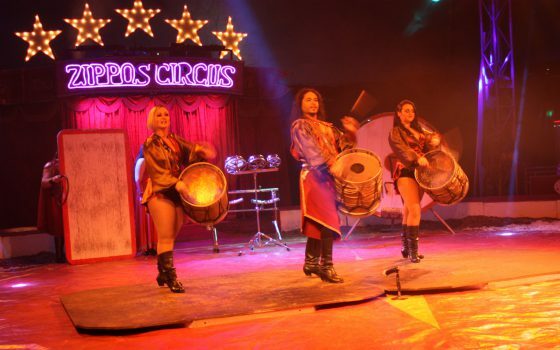 Then a few weeks ago Zippos Circus contacted us and asked if we’d like to attend one of their shows in Guildford. I weighed it up in my mind and decided maybe the time had come. He’s five and a half now. We have to give him the opportunity to experience as much as we can. Making assumptions on his behalf really isn’t fair. It’s up to him to ‘tell’ us whether he can cope. So we prepared as well as we could, showing Oscar plenty of online videos and pictures of Zippos Circus. He was more interested than I thought he’d be and loved the clips of the slapstick action on Instagram. My only concern was that he seemed convinced there would be “an elephant on a tightrope, that jumps into a bucket” and “tigers”. Yeah, thanks for that Disney! The days of exotic animals in circuses are long gone (in the UK at least). 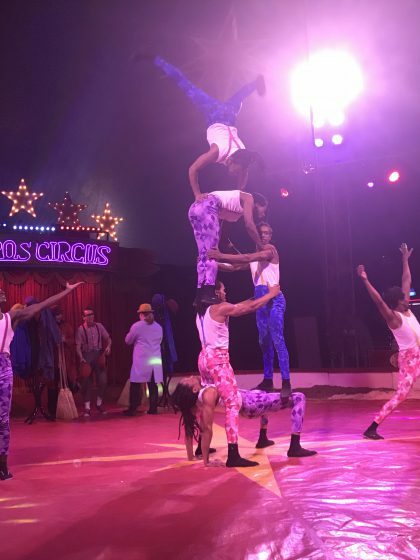 The only animals in Zippos Circus this year were the horses of the Khadikov Cossack Riders and Norman Barrett’s Famous Trained Budgies. I hoped he wouldn’t be disappointed. 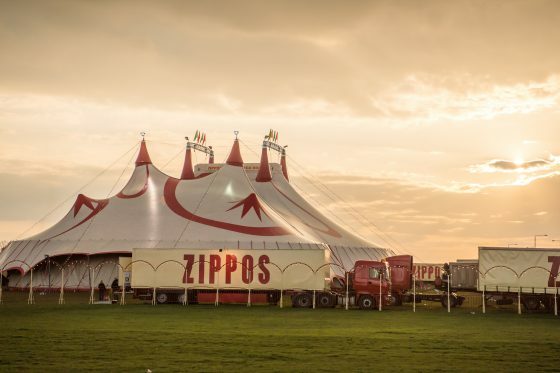 The Big Top itself was a sight to behold. 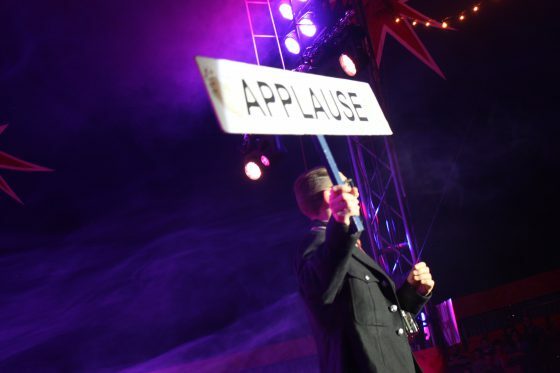 Despite confusion over where to park (we parked in the nearby Park and Ride, ignoring the handwritten signs that the car park was NOT for Circus visitors and hoped for the best), the immediate impression was one of excitement. The buzz of the families arriving was palpable. Oscar was given a programme which he studied in detail before we went in. Then we were shown to our seats by a very helpful member of the team. In fact all the staff we came into contact with were courteous and helpful. Oscar swotting up before the show. We sat and waited for the show to begin. With popcorn and without any real expectation. 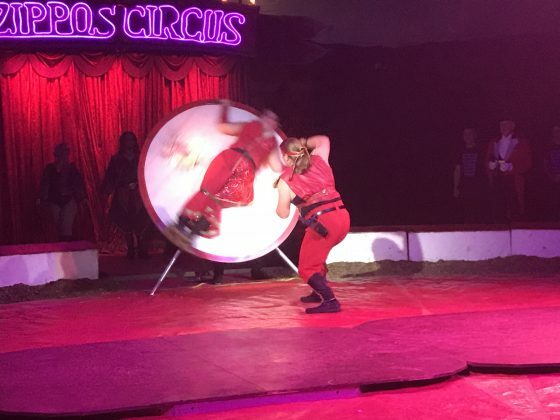 As it happened, this was the first time any of Family Savage had been to a circus. Our biggest concern was obviously how Oscar would cope. We were ready to leave at a moments notice. He was enthralled in a way I’ve never seen before. to the heart thumpingly awesome Los Carmonas Del Sol from Argentina. The way the show was structured really worked for us. The energy was so high and the pace so fast, Oscar had no time to feel like he was waiting around. He was fascinated from the start. 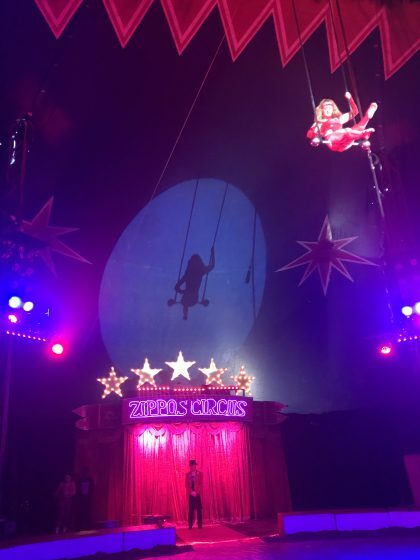 And add in a little peril, like trapeze artist Kimberly did as she flew over our heads..
…. well he was spellbound! My personal favourite was the knife throwing act. It had a real vintage feel and to be honest more of what I expected to see at a circus. Give that woman a round of applause. 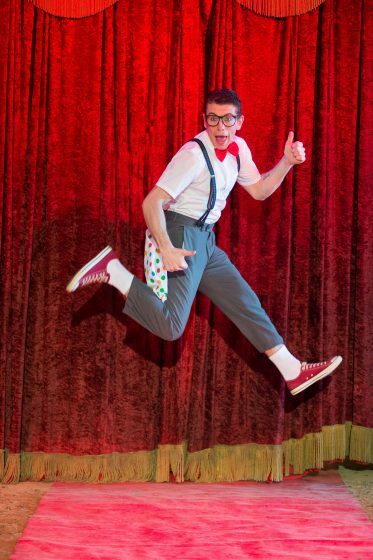 However Oscar’s absolute favourite was the slapstick comedy act Emilion Delbosq. 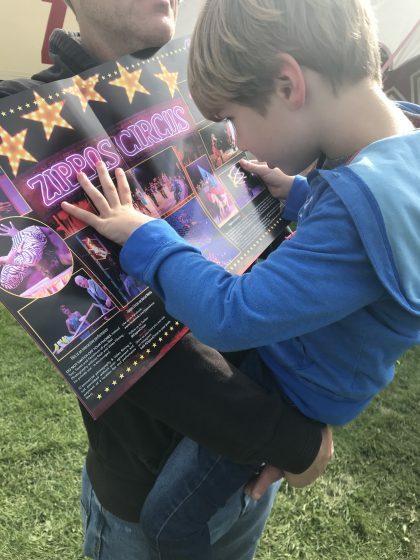 Zippos make it very clear on their website that this is a circus without “scary clowns”, but Emilion really was that comic element that circuses are known for and Oscar adored him. He talked about him for ages afterwards! Our only issue was something we hadn’t planned for at all. The intermission. After the interval, which Oscar coped with admirably, we had to come and sit back down for more acts. This threw him entirely. He was so confused. And that confusion quickly started turning to anxiety. Ben took him outside for a walk, but when he bought him back in he just couldn’t cope and announced very firmly that he needed to leave. Now. So of course we did. Ahh well, you live and learn. It meant we didn’t get to see the whole show, but then at 2 hours I wasn’t convinced we would anyway. It’s a long show for any five year old, let alone one on the spectrum. And I was just so proud he’d made it through as much as he did, I didn’t care that we missed the Globe of Steel motorbike acrobatic team or Alex the Fireman (!). We’d been to the circus and had a great time. Yes. Ben and I loved it way more than we thought we would and we’ve both said we’d like to go another time, without Oscar. An evening show without children would be a real night out! Would we take Oscar again. Actually yes. We wouldn’t pay for the fabulous (although rather expensive) ringside seats we had this time, only for him to want to leave half way through. But because he really enjoyed the acts he did see, we’d definitely take him again. We’d like to say a huge Savage Family Thank You to Zippos for inviting us and gifting us our tickets. As always this review is my own opinion and I have not been paid to write this post. 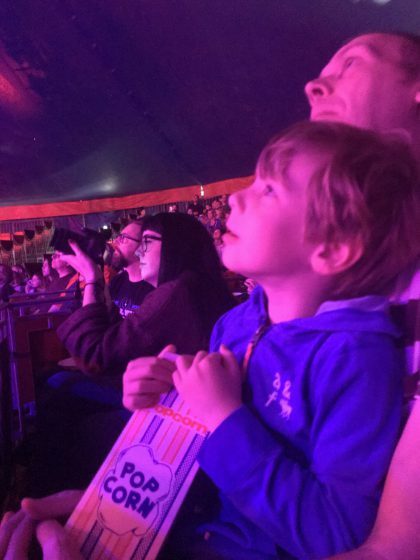 I would also like to point out that our experience of Autism at the Circus is ours alone and I do not attempt to speak for other children on the spectrum.